Argentina's Mothers of the Disappeared in protest march. Any effort to address missing persons during and after conflict takes this one step forward. It attempts to provide justice after death. However, what constitutes “Reason” must be seen through the lenses of both women and men. In a fractured and divisive community post-conflict, the nature of “ Reason” is a complex and elusive concept. But how we restore dignity to a disappeared victim and the family and promote “ Reason” and psychological healing is far less contested and helps a broader reconciliation agenda that helps address structural sources of injustice. The Offices of Missing Persons legislation and institutions set up after conflict can play a particularly important role in reaffirming the right of relatives of those disappeared. However, it is important that we develop new ways of conceiving of accountability mechanisms that provide a more gender sensitive experience of justice. We need to stretch our moral imagination in order to develop syncretic approaches to transitional justice that are both borrowed from other jurisdictions but deeply rooted in context. A feminist perspective can enrich the construction of the transitional justice field on missing persons. Women’s contributions and experiences and women’s activism must be reflected in framing the initiatives. In many countries in conflict and post- conflict, the presence of women, from the Mothers of the Disappeared in Argentina to the Mothers Front in Sri Lanka, women have altered the contours of transition justice. The Offices set up to address the missing must expose the harms to women as women, mother, wife and grandmother- thereby ignoring the specific harms shared by women or the specific economic and social status of women. In Argentina, among the 30,000 people who were disappeared during the “Dirty War” were an estimated 500 pregnant women and young children. Argentina has taken steps passing legislation to regulate the situation of the disappeared and their families. In 1994, Law No. 24.321 defined enforced disappearances and regulated the process for obtaining a judicial declaration of disappearances Law No. 24.411 established the right to pecuniary reparation for families of the disappeared. Very early on, as disappearances increased and fear permeated the country, a small group of grandmothers banded together. In April 1977, at the peak of the disappearances, the Mothers of Plaza de Mayo, wore white head scarves embroidered with the names of their missing relatives, and marched to the Plaza de Mayo in Buenos Aires. The mothers now grown to be grandmothers remain a public presence as they march along with other relatives of the disappeared in front of the Casa Rosada presidential palace, to search for their disappeared children who were kidnapped by the military dictatorship. The mothers and grandmothers or the Las Abuelas lobbied nationally to develop legal precedent to establish the use of DNA in establishing biological identity and pressured the government to support the development of a national genetic database that would allow all relatives of missing children to submit a blood sample for genetic testing. Established in 1989, Argentina’s database continues to be instrumental in the investigation of disappeared children. The Argentine genetic database set an important precedent and enabled the expansion of genetic tracing as an important tool in accounting for the disappeared and providing a remedy for victims. National and international funding for the database has been budgeted until the year 2050 and has expanded to Guatemala and Peru. 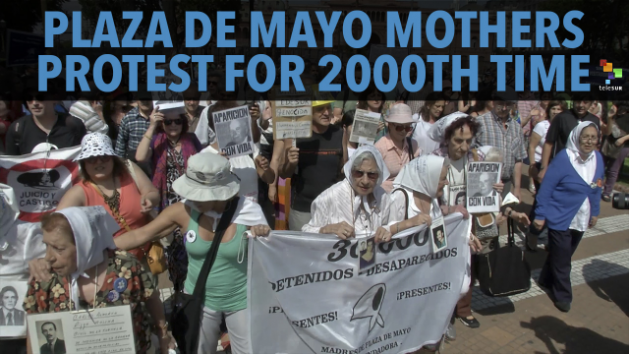 In April 2017, the Mothers of Plaza de Mayo Marked 40 Years of Searching for the Disappeared. The Mothers are also building a wall with the faces of thousands of disappeared people, to raise awareness of the disappeared during the country’s dictatorship from 1976-1983. What this shows is that we have to go beyond the tired notions of transitional justice. What is needed is a fuller concept of restorative justice that move away from criminal law formulations of sanctions to reimagining the possibility of restoring a lost social balance through a localization of the international practices and norms of transitional justice. *Rangita de Silva de Alwis was recently appointed by UN Women and IDLO to the High Level Working Group on Women’s Access to Justice.